�� economic stress is also felt locally right here in Oconee County. 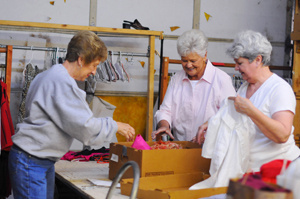 ACTS (Area Churches Together Serving) is supported by local churches to provide food and clothing for the needy. ACTS has � 63 new families added already this year and is presently serving 730 families! We hear unemployment and foreclosure figures regularly in the national news.However, the economic stress is also felt locally right here in Oconee County. ACTS (Area Churches Together Serving) is an organization supported by local churches to provide food and clothing for the needy. ACTS has special needs with63 new families added already this year.ACTS ispresently serving 730 families! We can help by donating canned foods, good clothing and money.This can be done at the ACTS location in Bogart on Tuesdays and Friday or through area participating churches. Reiny Hiss of Watkinsville First United Methodist Church is a truly dedicated county coordinator and works hard at the job. Pam Crawford is on the ACTS board and, along with many more, is an active participant with ACTS. See message from Pam and Reiny below asking for help. Please support with money, food, clothing, time and prayer. ACTS food demand is greater than ever!!! Reiny Hiss (ACTS Coordinator) reports this morning that there has been 63 new families added already this year and this is just February 2nd! This means that ACTS is serving 730 families and the food storage rooms are looking pretty empty! These families can come for assistance six times per year to ACTS and three times to the Mobile Food Pantries. Just last month the Mobile Food Pantry served 204 families and ran out of food. These families were referred to the ACTS Bogart location. This time last year when ACTS moved to its present location there were approximately 30,000 cans in storage. After a recent inventory there are only 9,000 cans!!! Reiny asked that this notice go out to our ACTS contacts and to the community so that the need would be known. He also wanted to list items appearing in this week’s paper that are promoted at local grocery stores that are cheaper than ACTS can purchase in bulk.All of us can purchase these items and take them to ACTS. This is a great community project for your church groups, youth groups, Sunday School Classes, Boy & Girl Scouts, Civic groups, your business or office, school classrooms and families. YOU can help by donating money but also by purchasing these items at these prices and carrying them to ACTS. ACTS is located at 130 East Thompson Street in Bogart. (Located near library and ball fields) Regular hours are Tuesday and Fridays from 9-1. Donations of money can be made to ACTS and mailed to P.O. Box 638, Watkinsville, Ga. 30677. Thank you for your consideration for this very worthwhile ministry! You can also help by donating good ‘in season’ clothing and by volunteering your time. Prayerful support is also needed.